By the summer of 1969, almost every element of the Apollo program had been tested and proven. The massive Saturn V rocket – the most powerful machine ever built and the first launch vehicle developed strictly for space applications – had shown it could reliably lift the Apollo modules and astronauts together beyond the Earth’s orbit. The command/service module (CSM) and lunar module (LM) could launch together, dock, and separate, and the LM could fly on its own. Russian and U.S. unmanned probes had performed soft landings on the moon, dispelling fears that spacecraft would simply sink into the powdery lunar surface. On the morning of July 16, as the Apollo 11 astronauts sat atop the 363-foot Saturn V at Kennedy Space Center’s (KSC) Launch Complex 39A, a million eyewitnesses packed themselves into the surrounding sandy flats and shorelines, waiting along with a worldwide television audience. Three and a half miles away, seated in grandstands, were half the members of Congress and more than 3,000 journalists from 56 different nations. 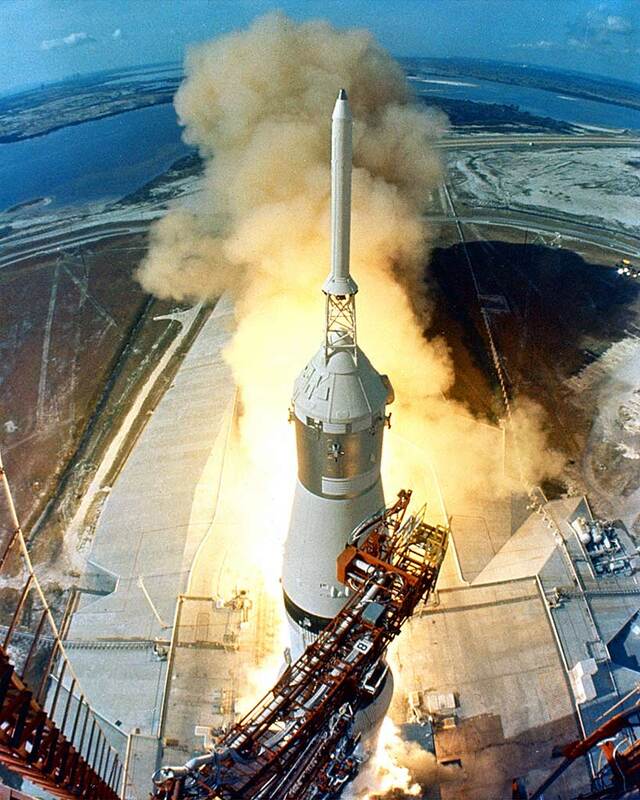 At 9:32 a.m. Eastern Daylight Time, the rocket blasted the Apollo 11 crew into the sky. It is now nearly a half a century since Apollo 11 blasted off from KSC. Project Apollo represented the peak of human technological achievement and daring. NASA, academia, and the aerospace community through their partnership were able to overcome incredible challenges. Now the attention of the world has returned to space with ongoing efforts to explore both the Moon and Mars. Again, we see the importance of NASA’s partnerships in helping overcome today’s challenges to sending humans back to the Moon, and eventually Mars. To celebrate the 50th-anniversary of humankind’s greatest adventure, Faircount will be releasing a special, high-quality, commemorative publication titled Apollo 11: 50 Years. The publication will see extensive distribution to personnel within NASA headquarters and its facilities across the country, other federal agencies involved in aerospace research and development, executives in the aerospace industry, and universities, colleges, and not-for-profit institutes collaborating with NASA on research. Faircount is no stranger to publishing about NASA, having worked under several NASA Space Act Agreements to publish NASA: 50 Years of Discovery in 2008, NACA/NASA: Celebrating a Century of Innovation, Exploration, and Discovery in Flight and Space in 2014, and most recently, in 2017, a special edition dedicated to the 20th anniversary of the International Space Station’s First Elements launch. When Faircount works with federal agencies we sometimes publish under contract, other times independently. This 50th-anniversary edition is being published independently of NASA, but with its knowledge and awareness. Commercial spaceflight developers, operators, and spaceports, including suppliers supporting commercial spaceflight, such as providers of mission support services or training services. Key decision makers from the Aerospace Industry, including aircraft and spacecraft manufacturers, key prime contractors, and suppliers. Universities, Colleges, and Not-for-Profit Institutes collaborating with NASA on research in the areas of aerospace, mechanical, electrical, and systems engineering; materials science; applied mathematics; meteorology; and other related fields. Package includes: video, ad in digital edition, ad in print edition, and hyperlinks. Contact us for additional information and rates. Contact us for additional information and rates. Proofs: We recommend supplying a color proof that accurately reproduces the color of the ad as it will be used for color matching on press. All proofs must be representative of the ad supplied and should be a high-quality digital proof that meets SWOP standards. If copy changes are made, the proof should be marked “For Color Only.” Color correctness cannot be guaranteed if color proof is substandard, or no proof is provided. Various images and text on this website in no way are used to imply an endorsement by National Aeronautics and Space Administration or U.S. government for any claims or representations therein. Neither NASA nor any other component of the Federal Government or the Department of Defense has approved, endorsed, or authorized this promotion.